There's a saying - don't break with your shooting cue and don't shoot with your breaking cue. 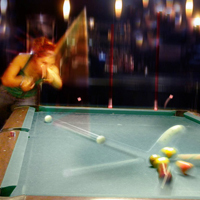 Simply put, break pool cues were made for breaking. They feature stronger ferrules and harder tips, allowing you to hit with maximum force without worrying about damaging your shaft or mushrooming your tip. PoolDawg carries jump cues, break cues and pool break sticks from several manufacturers including Action, Elite, Viking, Predator, and Stealth.